This massive overhaul of one of Metro’s busiest stations, described as a “long-standing priority of the Metro Board,” will be the largest investment in a single transit terminal thus far. And it’s long overdue. The 27-year-old station connects around 30,000 passengers daily to the Blue and Green Lines, several Metro bus lines, and a range of local buses and shuttles. But moving between transit options is not all that comfortable or convenient: the stairwell connecting the Green and Blue Lines is narrow and creates bottlenecks (especially when the Sheriffs would stand at the landing midway down, checking TAP cards), has TAP machines that seemed to regularly malfunction, and can make life miserable for those trying to move between platforms with strollers or bikes. As the Blue Line and bus lines are located under the 105 freeway, the station also tends to feel quite dark and not particularly welcoming. The Willowbrook/Rosa Parks Station, looking south. Sahra Sulaiman/Streetsblog L.A. The redesign should help passengers make seamless connections between transit options and new affordable housing, the public library, the Martin Luther King, Jr. medical complex, and retail shops just south of the station. According to Metro’s project summary (found here), the Blue Line platform will be extended south (numbers 1 and 2 below), to bring it out into the sun and and to connect passengers to the new Civic Plaza (no. 7). 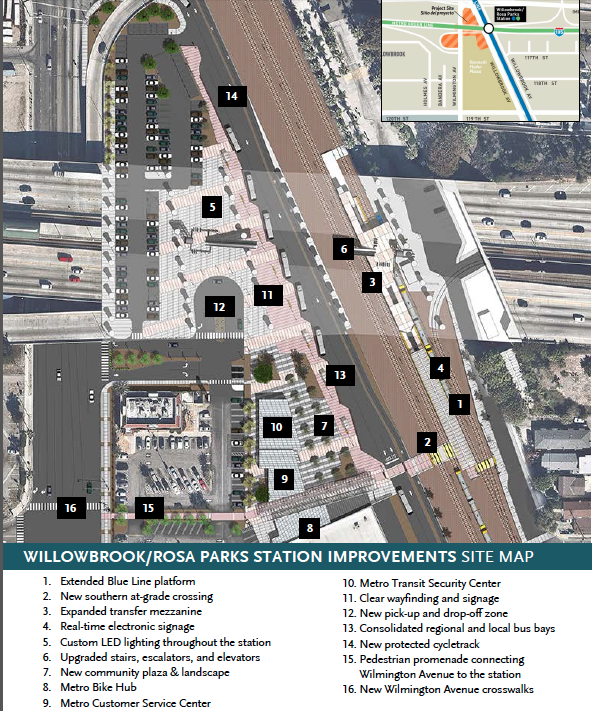 The existing bus depots will be consolidated along that new plaza, on Willowbrook Avenue West (no. 13). Connections between the Green and Blue Lines will be made easier with the expansion of the transfer mezzanine and improvements to stairwells, escalators, and elevators (no. 3). The park & ride lot will also be reconfigured, a pick-up and drop-off site will be added (no. 12), and the station as a whole will see new landscaping, lighting, shelters, and circulation elements that will make the station more inviting. Connecting to the station itself should be easier as well, at least from the south. New crosswalks at Wilmington (including at 120th), pedestrian promenades, improved at-grade pedestrian crossings (no. 2), and a (super short) buffered bike lane along Willowbrook Avenue West to 119th St. should also help make connections and movement through the area easier. The new pedestrian plaza will be home to a new Metro customer service center, (below), a security facility, an operator’s lounge, and a bike hub, where cyclists can lock up their bikes and get (or learn how to do) repairs. The Metro service center will include a new transit court to make it easier for residents to appeal and pay fines. Considering that the Blue Line-riding population count among the region’s most heavily ticketed, this is both good (in that it could make it easier for people with a limited transit budget or time to contest or take care of any tickets) and bad (in that both that and the presence of a security facility on site might mean folks are more likely to be ticketed than they already are). The security facility planned for the site was intended to be a Sheriff substation. 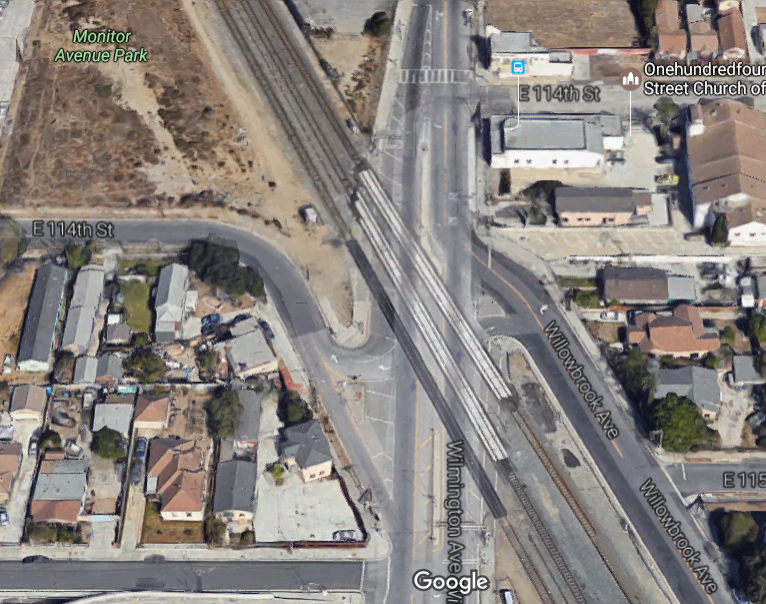 With a newly approved policing contract giving the bulk of the responsibility for policing the trains within the city of L.A. to the LAPD, it is not clear who will occupy that space now, or whether Metro and the Sheriff’s Department will abandon the existing transportation station across the street from the stop, on Willowbrook Avenue. Beyond these services, Metro also envisions the plaza as a hub for community activities, including movie nights, special exhibits, community celebrations, and food trucks. Should the contract modifications be approved, it is not clear what the new timeline for the project would be. At present, RNL Design is expected to finish their redesign of the station later this year. Once design is complete, permitting and construction bidding will get underway. Metro anticipated the bidding process would continue through early 2018, with actual construction beginning soon after and being completed in 2020. Federal funding deadlines, which require project funds to be spent by 2021, don’t leave much room for any delays the additional design work might require. While the upgrades for the south end of the station look very promising, it appears that connecting to the station on foot or by bike from the north side will continue to remain uncomfortable. Because of the angle at which the tracks cross Wilmington (below), there aren’t too many simple interventions that Metro can perform to make that crossing easier. Access to the station from the north – particularly for cyclists traveling southbound on Wilmington (or pedestrians walking on the west side of Wilmington) will remain somewhat fraught. The station is just out of view, at bottom. Source: Google maps. That said, the use of bollards or planters to expand that traffic-guiding triangle just south of the tracks, the addition of zebra crosswalks, and curb cuts to the sidewalks around the intersection could help give pedestrians and cyclists more visibility and smoother passage. For more information on the upgrades, see our past coverage here and Metro’s agenda and related documents here. The Metro service center will include a new transit court to make it easier for residents to appeal and pay fines. Considering that the Blue Line-riding population count among the region’s most heavily ticketed, this is both good (in that it could make it easier for people with a limited transit budget or time to contest or take care of any tickets) and bad (in that both that and the presence of a security facility on site might mean folks are more likely to be ticketed than they already are). You assume everyone riding the Blue Line are either taking care of their tickets or doing something illegal to warrant a ticket. How about those of us who are buying a ticket and riding without harassing anyone else? Your article sure doesn’t consider us at all. No, that is not an assumption I have. I would say, however, that that seems to be an assumption Metro has. 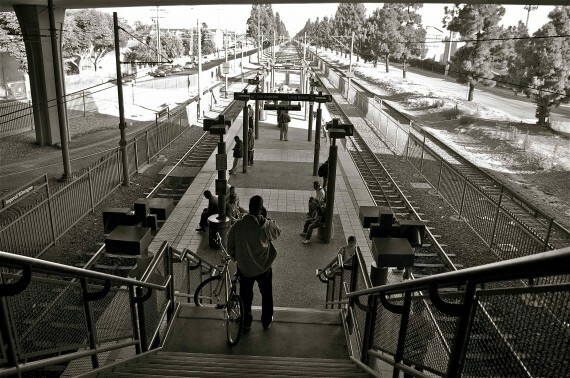 A civil rights complaint was filed against Metro recently because black and brown riders are so heavily policed on the Blue Line. Black riders make up 19% of the rail ridership but 50% of those ticketed and 60% of those arrested. And again, most are happening along the Blue Line throughout South LA, with Watts being one of the stops that is very heavily policed. I did one of my first Place It workshop for visioning this station almost 10 years ago!